Just one step and you're in the magical labyrinth of Rome and only 300 m from the Vatican Museum. 50 m from 'Ottaviano - San Pietro, metro station. 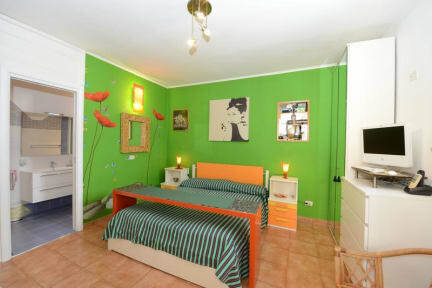 A recently renovated antique building on the 2d floor, perfect for young and dynamic people who want to enjoy the city. All the rooms are well equipped with comforts necessary for a pleasant stay. Terrace - Solarium 200 sqm, on the 7th floor, offers a magnificent view of the entire city, with modern comforts to relax. Reception is OPEN from 10:00 to 13:00 and from 16:00 to 20:00 - If you need to arrive after this time you have to CALL and leave your MOBILE NUMBER if you have!! RING AT THE BELL NUMBER 13 WHEN YOU ARRIVE! 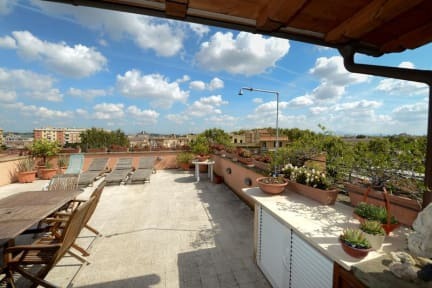 is a LOFT at the 7th floor of the same building, a real apartment with private bathroom, computer with internet and 100 mQ of Terrace with a magnificent view of the entire city (Saint Peter Cathedral, Saint Angel Castle etc..
available for special occasions. Please contact the staff directly ! Prima plek om te verblijven in Rome. goede gastheer en gastvrouw. Nette ruimtes. heerlijk geslapen.